Ekbal Al-Othaimeen woke up one day to find her home country engulfed in turmoil. Soon, she and the rest of the people in Kuwait found themselves caught up in the chaos of the Gulf War. 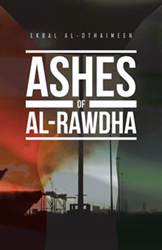 She looks back to the harrowing experience and the redemptive journey in a time of war in her book “Ashes of Al-Rawdha” (published by Trafford Publishing). In her candid, deeply moving memoir, Al-Othaimeen takes readers on a first-person view of the lives of Kuwaiti citizens during the Gulf War. “Ashes of Al Rawdah” combines the different aspects of the war and its effects on an individual, a close-knit family and a community. With its beautifully described characters, intimate events and unique perspective, the book is a firsthand slice of life of people caught in a war they did not expect or ask for. Al-Othaimeen hopes her account will give people an intimate glimpse into the other side of conflict, a side that is not easily captured in the news, media or simple statistics. Her work is not just an indictment of war, it is a story of a search for love, meaning and hope in a chaotic, increasingly hostile world. Ekbal Al-Othaimeen is an associate professor and head of the Library & Information Science at the College of Basic Education in Kuwait. She obtained her master’s degree at Syracuse University, New York and her Ph.D. at Wales University in the United Kingdom. A member of Amnesty International since 1992 and other human rights organizations, she is active in human and women’s rights issues and social causes in Kuwait.